Make those nefarious pirates walk the plank with this helpful guide. We shared some of our best Angry Bird Epic tips to beat the Golden Pig and get Lucky Coins in our Angry Birds Epic guide. Today, we have some of our best strategies for consistently beating the Pirate Pigs. If you're new to the game, take a few minutes to familiarize yourself with our pig guide for some tips on how to beat the various types of Pig Pirate picaroons. There are many ways to take on the Pirate Pigs in Angry Birds Epic, but in order to get three stars and increase your chance of getting more loot, you'll need skills and strategy. Knowing your enemy's weaknesses is the best way to make the most of your birds' abilities. A Pirate Pig has a decent amount of health and is immune to harmful effects; their HP ranges from 91 to 785. Battles have the potential of being long and drawn out, so choose birds that don't dish out attacks with harmful effects. As you progress in the game and enter a Pirate Battle to recover the Black Bomb Ship's Wheel from Big Pirate, it's best to avoid a long battle that will prevent you from maximizing loot. Selecting the right team combination for the job is key to making battles successful. The team we use regularly that ensures a three star victory consists of Chuck, Matilda and Bomb. Having a balance of passive offense, Health regeneration and Strength is the perfect combination for withstanding any Pirate Pig attacks. Bomb's Pummel attack does serious damage in combination with his ARRR! power-up. Matilda's Healing Shield replenishes energy with every incoming attack over time for three rounds, and her Healing Strike will offer a 20 percent health increase of the damage dealt when Cleric Matilda attacks. Utilizing Chuck's Shock Shield on your fellow flock will make the Pirates regret putting their dirty green trotters on you. Using power-ups and defensive effects in combination with a good attack strategy will make the battle easier and shorter. 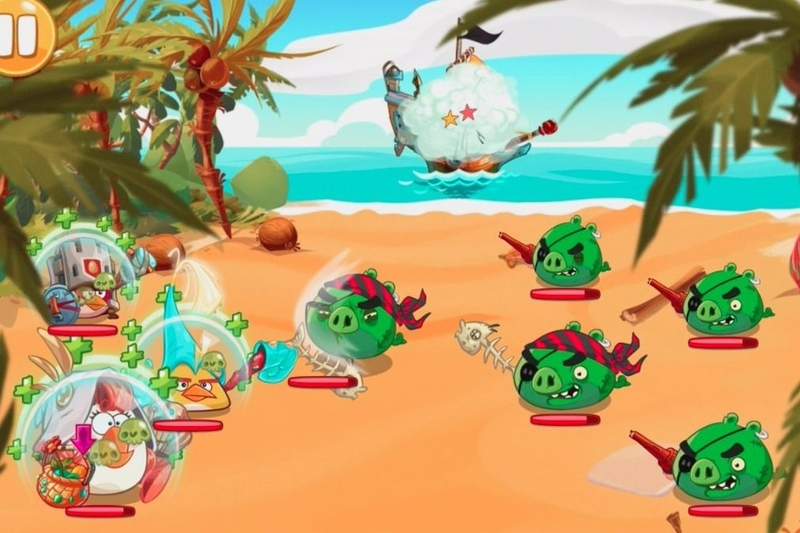 How do you determine what strategy to use on Pirate Pigs in Angry Birds Epic? Knowing what strategy to deploy against pigs is determined by your abilities. Having a sting defense is the best strategy when deciding how to equip your flock Class, Weapons and Off-handed items. Experimentation with different Class, Weapons and Off-handed items to compliment your birds' primary and secondary abilities is the only way to learn what works on various Pig Bosses. In the case of Pirate Pigs, you have to deploy a defensive strategy to take them out. Since you attack first, start with Bomb's ARRR! power-up to increase team attack power. Cleric Matilda's Healing Shield will mitigate the damage for the next three rounds, and finally, Chuck's Storm attack will see an increase in attack damage, while Shock Shield will add a little bite to any Pirate Pig attack for the next three turns. You're off to a good start before any Pirate Pig even lays down its first attack. It'll receive damage from Shock Shield defenses and most likely target Matilda. Use Matilda's Healing Strike to answer any damage dealt. Continue to attack for three turns with Bomb and Chuck after he's protected the flock. Make sure you target the most threatening Pirate Pig. You can identify the pig by seeing which one's about to launch an attack (attack meter). When the status effects wear off, restart with the defensive strategy and repeat the steps until these Pirates walk the plank. If you've followed these strategic steps, you'll beat the Pirate Pigs with three stars, get maximum loot as well as your daily Lucky Coins reward. Check out our guide for more details on how to select your Classes, Weapons and Off-Handed items to help with setting up teams to battle various Pig bosses. Don't let your eggs get scrambled, and remember to like us on Facebook so we can team up to stop King Pig. Share your tips and strategies for beating pigs in the comments below.